A complete John Hewitt autobiography will be launched for the first time on Monday, July 22, at the John Hewitt Summer School, Marketplace Theatre, Armagh. 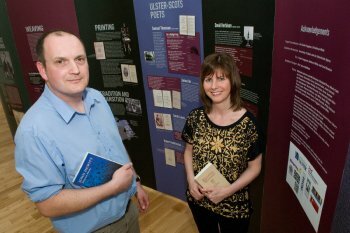 Dr Frank Ferguson and Dr Kathryn White, lecturers at the University of Ulster School of English and History, at Coleraine, are editors of 'A North Light', the first full edition of Hewitt’s full manuscript. There has been much speculation surrounding John Hewitt’s life (1907-87) and his self-imposed exile in Coventry. Now, 50 years after the initial writing of his autobiography, his own account is finally revealed. While a few of the chapters have been published previously, this eagerly anticipated memoir, will be a landmark book in Ulster writing and will shine a light on the life and work of one of Ireland's most important poets. It also provides a fascinating glimpse into the cultural life of Northern Ireland in the early 20th Century. Also being launched at the event in Armagh, is a new exhibition, which uses rare Hewitt family photographs and archival poetry notebooks to depict significant encounters and achievements - and his words are employed to articulate his belief in the importance of place and the significance of home. The autobiography and exhibition are part of a joint project by the University of Ulster in partnership with the John Hewitt Society and the Causeway Museum Service. The Heritage Lottery Fund has awarded the project £61,000 to produce the exhibition and subsequent outreach programme that celebrates the contribution of John Hewitt to Northern Irish literature, art and heritage. Dr Ferguson and Dr White commented: “We are delighted to be working on this project, and are thrilled that the exhibition has been designed by John McMillan, Emeritus Professor of Graphic Design at the University of Ulster. Speaking on behalf of the John Hewitt Society, Anthony Kennedy, the director, said: “The John Hewitt Society promotes the ideas, ideals and work of John Hewitt with the aim of promoting a more shared society in Northern Ireland, based on mutual respect and understanding. “The exhibition contributes to this by presenting Hewitt's life and work in an accessible way and encouraging people to explore these further. The John Hewitt Home Words Exhibition and 'A North Light' will be launched at 5.30 pm on Monday 22nd July at the John Hewitt Summer School, Marketplace Theatre, Armagh. A North Light, published by Four Courts Press, is available to buy in print or eBook format, priced £19.95.